Sometimes it is the little things that help with living in a small space. Our Tiffin Allegro is 33 feet long with no slide outs. It means we have very little space inside, a tiny kitchen, and limited storage space. While we try to buy as much food as possible at once to reduce trips to the store, we also try to buy in bulk to reduce costs. To keep all this in order, we have to rely on a simple shelving solution. While it may not be the prettiest, it certainly is cheaper. 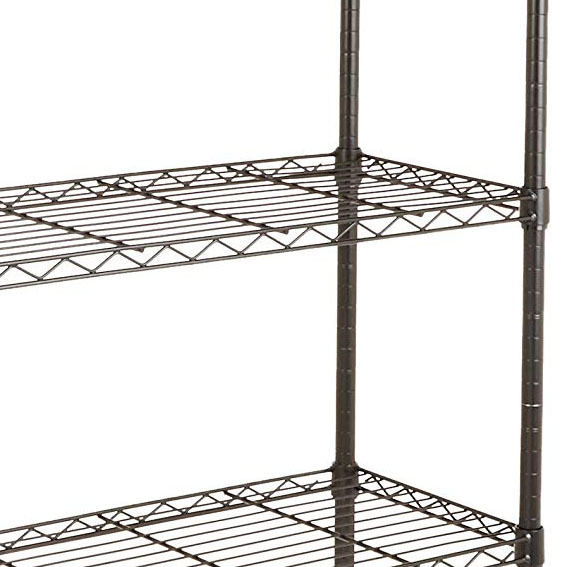 We have gone with a few wire shelves purchased off of Amazon. While we have had to make some adjustments to have the best places for them to sit and we will have to put stuff on the floor or anchor them the next time we move, for now they help us organize and clean up the space and give us easy access to everything. We now have a shelf next to our stairs coming inside for boots, work gloves, sandals, and our shower items. We have a shelf in the closet for toilet paper, garbage bags and other less used bathroom and kitchen items. We have a shelf in our pantry, though it still needs work. Our last shelves are where the dinette was and store kitchen appliances, containers full of dry goods, and other kitchen items. It is not perfect, but it is better. While our RV is always a work in progress, it is getting better. By having places to put things and keeping them easy to access while still out of the way, our living situation slowly improves.